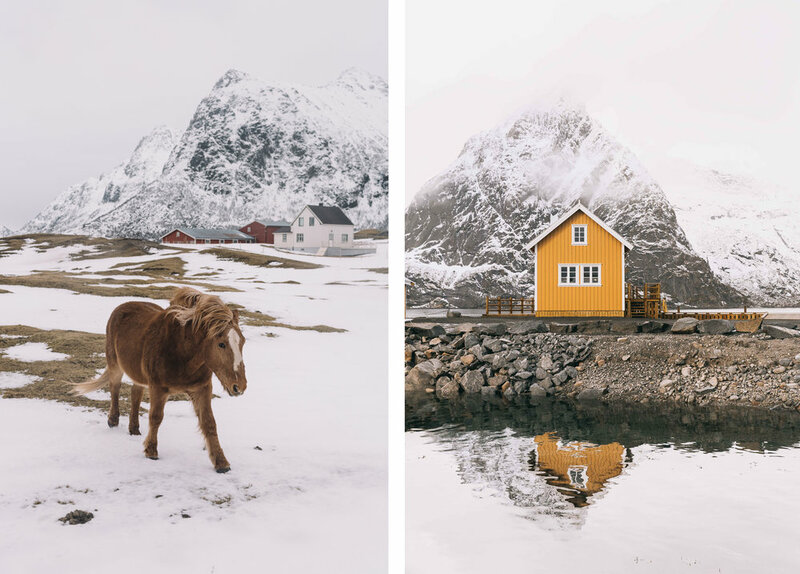 Lofoten has been popping up all over Instagram feeds lately and for good reason. This chain of islands above the Arctic Circle, on the shores of the Norwegian Sea offers an unparalleled landscape of majestic mountains, deep fjords, squawking seabird colonies and long, surf-swept beaches. 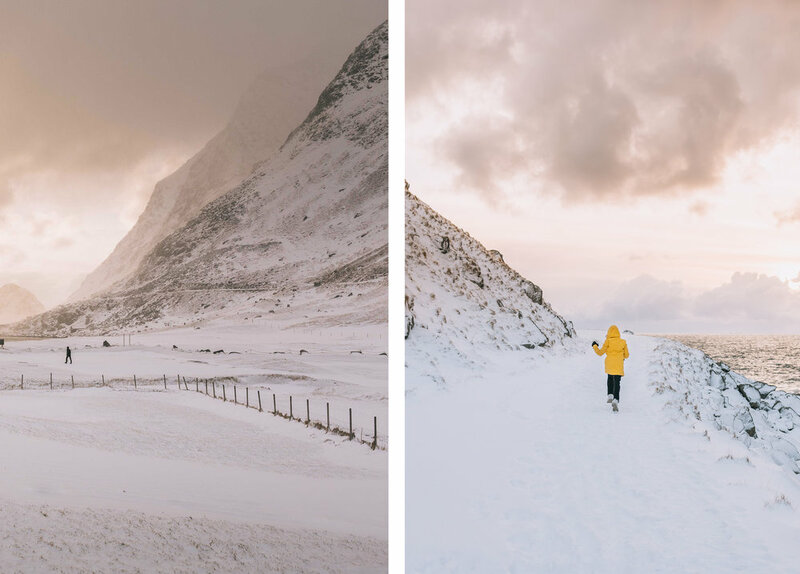 There's no doubt that Lofoten has become one of the most attractive European destinations, especially for photographers and of course instagramers. Almost everyone has seen the typical photo of red cabins surrounded by majestic mountains, but there is so much more to see in Lofoten. You can take just about any road Lofoten and find a breathtaking location with absolutely stunning views. The hardest part is trying not to stop every few miles to snap photos, which is why we narrowed it down to a few of our personal favorites. Hamnoy is probably the most famous place to visit in Lofoten. It's the place where you can get that famous "red cabin" photo. When you first approach this tiny village, you come across a long bridge that offers the best view of all the red wooden huts in Hamnoy. We advise that you spend a few nights here, so that you can get the chance to witness and photograph under a variety of different conditions. One of the few locations where you'll actually get to experience some Lofoten sun. Even if you are just passing by, we recommend that you take some time to stop and go for a walk on the beach. This is one of the oldest fishing villages in Lofoten, with huts riddled all along the bay — offering incredible views of the ocean. This place is really worth visiting, despite the widespread smell of fish and fish heads hanging just about everywhere. Looking to take photographs of a dreamy Lofoten sunset? Than these two, easily accessible beaches should be top on the list. They are situated next to each other and connected by a tunnel just over a mile long. Simply enjoy a 30 minute stroll from one beach to the other. Ballstadt is a more relaxed alternative to Hamnoy or Reine, but still worth a visit. In fact, it's an ideal location for activities like kayaking and hiking. If you plan to hike near or around this small town, ask a local. They'll point you in the right direction of a hike the offers the best views in town. 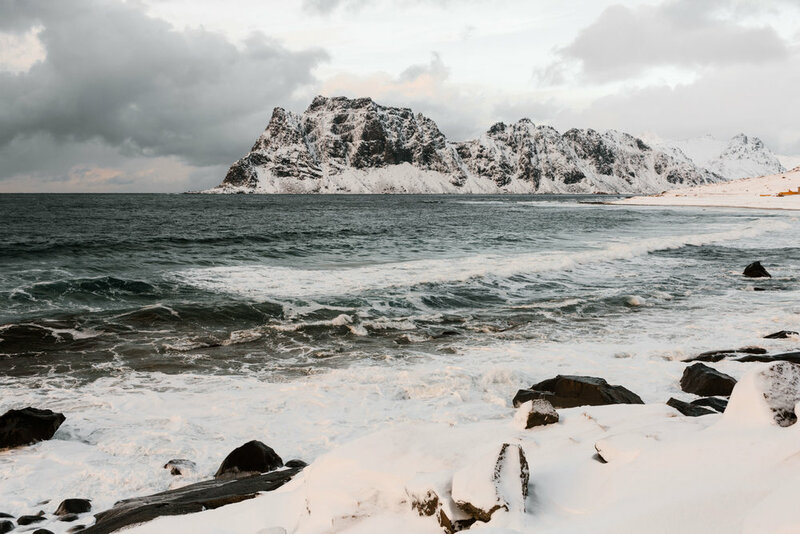 Believe it or not, Lofoten is not only ideal for photographers, but also for surfers. Yeah, people actually don't mind catching a wave in ice-cold Norwegian water. One of the most famous beaches for arctic surfing is called Unstadt. There's always a chance that you'll stumble upon some arctic surfers when visiting this area. If you plan to spend more than five days in Lofoten, we recommend that you book accommodations in more than just one location. This will allow you to easily explore many different parts of the island. We suggest spending the first few nights in Hamnøy, since it's closer to the ferry station, and a couple of nights in Ballstadt. Look for accommodations that come equipped with a kitchen, this will save you a ton of money. One of the dreamiest places that you'll ever encounter — offering the opportunity to actually stay in the famous red cabins that everyone photographs in Hamnøy. They offer two bedrooms accommodations; equipped with a living room, kitchen and more importantly... incredible mountain views right outside your window. What else do you need? Click here for more information. This is a bit more modern, while still remaining cozy and welcoming. 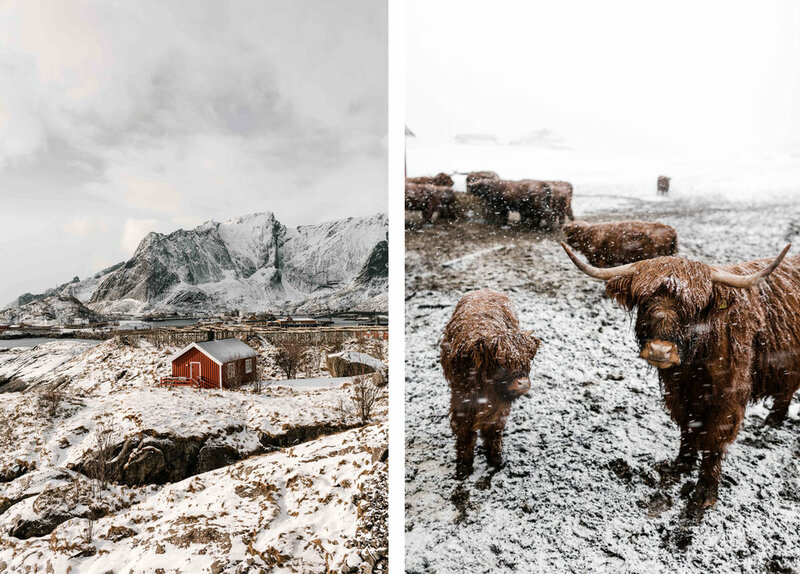 The owners are kind enough to share tips on where to go, as well as some history of Lofoten. The Hattvika Lodge is situated in Ballstadt, with easy access to the must-see beaches mentioned above. For more information click here. In Norway it's also pretty easy to do some couch-surfing — especially in bigger cities. This isn't for everyone, but if you're willing to try it you'll usually be rewarded with a friendly host and an awesome free night stay. Usually the cheapest route to get to Lofoten is by booking a flight to Bodø (with a transfer in Oslo). Once arriving, you can take a direct ferry from Bodø to Lofoten. This journey takes around four hours and costs around 30 euros per person. Before getting to the islands you should also rent a car. Which can be done in Bodø as well, since it's a bit cheaper than renting a car in Lofoten (approx. 50 euros per day versus 80 euros per day). Prepare yourself for the widespread smell of fish, which you'll get used to pretty quickly. Fishing is one of the most important sources of income in Lofoten, so there are tons of fish (specifically fish heads) everywhere. You might even end up missing the smell once you are gone, as odd as that sounds. Weather forecast are very unpredictable in Lofoten. Your weather app might say one thing, while the situation at hand is completely different. Don't worry, this is absolutely normal there. We advise that you are always ready to go outside at a moments notice — it's worth it. Look to encounter many photographers during your Lofoten trip. They are everywhere. Lofoten is quickly becoming one of the most popular touristic attractions, along with Iceland and the Faroe Islands.